The author is “a Lecturer in Philosophy and Visual Culture” in Ireland. Also he has a label (Dot Dot Dot Music) and he “occasionally performs in the noise “bands” Safe, and Working With Children.” He writes books about music and about philosophy. In the current title you will find many references to philosophers such as Theodor Adorno, Walter Benjamin, Georges Bataille and more. Also, the term “noise” is not used in the same way as I use it on this website, to refer to a specific kind of (industrial) music. For Hegarty “noise” can be anything from consciously playing with the listeners’ expectations, to intentional ‘mistakes’, to unruly ‘messages’ (or the lack of them) to sounds that are unpleasant. Therefor the book is not just about industrial music. The book has chapters about early musical experimentations, jazz music, rock music, industrial music and hiphop and then more in depth about the scene in Japan and then Merzbow in particular. The last chapters are about sound-art and about sampling. The author knows a massive amount of bands and projects, largely unknown to me (except for in the chapters about industrial). He discusses the (possible) functions of noise in music and the different ways of making noise. 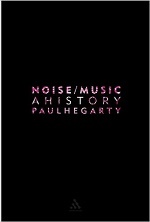 Somewhat generally speaking, the book is about the history of experimental and avant-garde music. It is not always clear how one type of music ‘grew’ from another, but I can say that the book will teach you a bit about the context where much of the music reviewed on this website can be placed in.